Elmer Avenue Green Street Opened and Drenched! I had the pleasure of attending today’s grand opening ceremonies for the excellent green street project on Elmer Avenue in Sun Valley. There’s a lot to say about the project, so here’s a brief post with mainly shots of the opening event, and I will post again soon with more details. The project’s unwieldly full name is the Elmer Avenue Neighborhood Retrofit Project, a part of the Water Augmentation Study. It has many many partners responsible, but among the leads are the Los Angeles and San Gabriel Rivers Watershed Council, the city of Los Angeles (multiple Public Works Bureaus and others), TreePeople, the federal Bureau of Reclamation, the Water Replenishment Distict of Southern California, Metropolitan Water District, the L.A. County Department of Public Works – Watershed Management, the L.A. Department of Water and Power, the state Department of Water Resources, the city of Santa Monica, and Urban Semillas! The project extends one block of Elmer Avenue from Keswick Street to Stagg Street. That’s in Sun Valley, near the intersection of Tujunga Avenue and Saticoy Street – about four miles due north of the North Hollywood Metro Red Line Station. 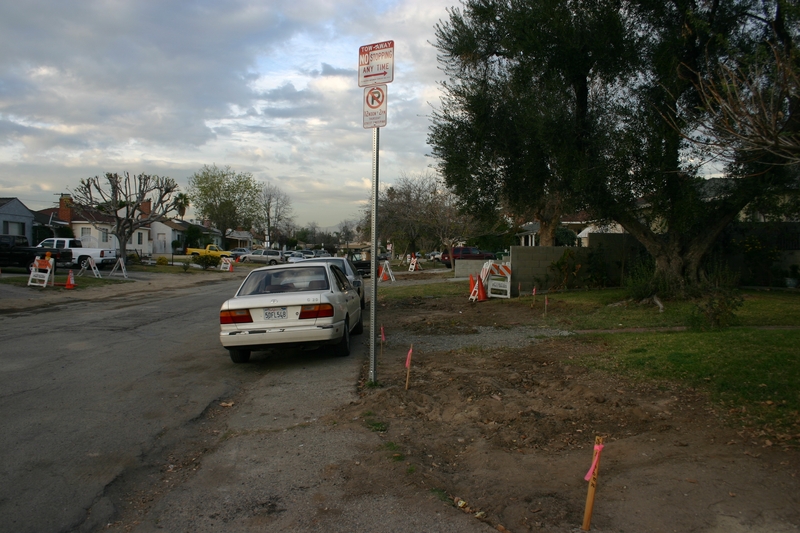 Until recently the street had no sidewalks, no curbs, no street lighting. This is still visible via google street view. 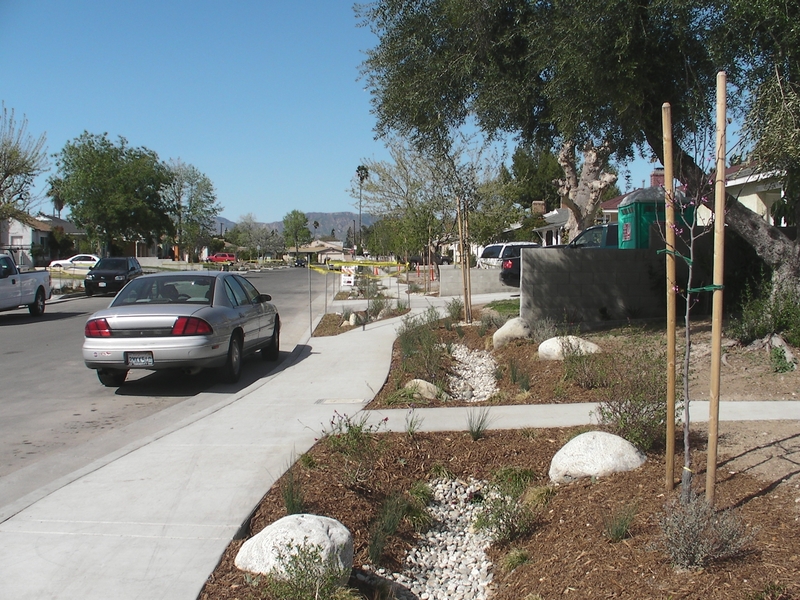 The green street project added a large underground infiltration gallery, curbs, sidewalks, vegetated swales, lots of drought-tolerant native landscaping, solar streetlights, permeable paver driveways/walkways, French drains, and even rain barrels. Most of these features are in the public right-of-way, though some are on private property where owners opted in. These watershed management features combine to reduce flooding, increase water supply, reduce water use, prevent pollution, provide habitat, and beautify the neighborhood. Today’s celebration was hosted by LASGRW’s Nancy Steele and L.A. City Public Works Commissioner Paula Daniels. Remarks were spoken by Councilmember Tony Cardenas, Bureau of Sanitation’s Enrique Zaldivar, Tree People’s Rebecca Drayse, and others. Guests of honor were many of the residents who appeared excited to show off their fancy remodeled street. I’ve never seen so many people taking such interest in water entering a stormdrain. This one drains into a large-scale underground infiltration gallery. Previously the street had no stormdrains and suffered from some flooding during the rainy season. More images and details on all the great project features coming soon. § 2 Responses to Elmer Avenue Green Street Opened and Drenched! You are currently reading Elmer Avenue Green Street Opened and Drenched! at L.A. Creek Freak.